Anyone who has wandered into a Kid Robot store will know the Munny (pronounced Muni) doll. It's a blank, white vinyl character you can decorate yourself with pens and crayons. If there was a word like "androgynous" with an expanded meaning to encompass "indeterminate creature" then it would describe the Munny. It's vaguely human, vaguely animal, vaguely neither. 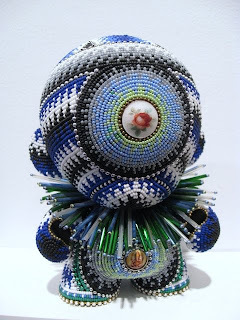 Jan Huling, a former advertising creative, decided to bead the heck out of the minimalist Munny, making it decidedly maximalist. The result is a stunning twist on this famous, faceless anime icon. I stumbled across it in Lyons Wier Gallery, an inviting, accessible corner space on 7th Ave which rubs shoulders with the more pedestrian Jamba Juices, Pinkberrys and falafel joints, quite distant from the main westside Chelsea Gallery district. New York Fashion Week has gotten off to a sad start. 40 years young Alexander McQueen, a celebrated fashion designer, hanged himself in a hotel room yesterday. I happened to walk past his store in the Meatpacking District, today. It's right near Stella McCartney's store, currently depicting big pixelated signs saying LOVE. Flowers were laid on the pavement and the blind was drawn. As if in sympathy, many other stores in the area were closed, when they'd normally be open - a Friday night at 7pm. I don't have any McQueen threads - the pricing is stratospheric. But I have occasionally wandered into the store for a poke around. Boutiques in NYC are like mini-museums where you can actually touch the art, try it on, and if you've got the cash, take it home. Imagine trying that with a Picasso!